Compared to English, I think, Nepali is a very complicated language. Just to say “You” there are so many ways in Nepali. In English “You” is a second person pronoun of both singular and plural but in Nepali it is a totally different story. Timi – used for a person younger than you or of similar age/ stature. Hajoor – Mostly used by Brahmins and Chhetris for addressing older people and to show lots of respect to people of higher statute. Other ethnic groups don’t use Hajoor but use Tapai instead. The reason I am writing this post is how these words have affected my life after my wedding. Before our wedding, I had known AS for almost 12 years and we were friends. So I used to address him as “Timi” and he used the same for me. It was perfectly fine and there were no issues. After we got engaged, my mum heard me talking to AS using “Timi’ so she told me not to use “Timi” but use “Tapai”. I ignored her suggestion and kept using “Timi”. I felt more comfortable and I was used to it anyway. I also felt bad that he was allowed to call me “Timi’ but I had to change to “Tapai”. Before the wedding, I had to go and meet my MIL for shopping. AS was in Australia then, so it was just me and her. In that meeting she told me, try to use “Tapai’ for AS when there are people around us but “Timi” is fine when we are alone. I understood her point. She didn’t want other relatives to talk about me being disrespectful of my husband just because I didn’t live in Nepal. So after our wedding when I was in AS’s house, I switched from using “Timi’ to “Tapai” all the time. It was easy for me to follow just one way of addressing him and not changing it depending on whether someone was near us or not and because it was just too confusing otherwise. When we came back to Australia, I didn’t realise that I was calling him “Tapai” all the time. I got used to it and I know he liked it so I didn’t bother to go back. Also I didn’t want to say “Tapai” only when we were Skyping with our parents. Now, some of my friends tease me saying that I am being “a good Bhuhari” and some say I am acting weird after the wedding. 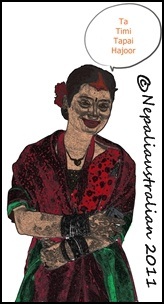 I have many married couples around me but apart from my cousin K, who was married in Nepal and lived there two years before coming to Australia, no one addresses their husband as “Tapai’. They all use “Timi” and they find it odd that I use “Tapai”. I am sure they must have gotten used to this by now but I still feel that a lot of times, people look at things I do in a negative way even when I do the right thing. 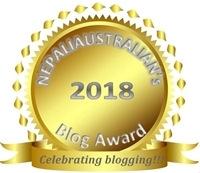 It would have been perfectly fine if I had been a Nepali Bhuari but people find it hard to believe I use “Tapai’ as I am an Australian Bhuari. This entry was posted in Marriage and tagged bhuari, Hajoor, Ta, Tapai, Timi. Bookmark the permalink. I think Nepali is beautiful language even though it is bit complicated. I used “Ta” a lot .Guess it is not so good but I am used to it. I think ‘ta’ is fine with friends as I used that a lot as well with my good friends. Ya I think it is casual and comfortable with friends. Right…..Nepali is more different to learn as english language. I have it so hard to learn nepali language. In german language there is timi – Du, tapaii – sie. If we to approach a older or a people witch we don’t know then we have to say tapai / Sie. And to children or freinds and family we say timi / du. In germany isen’t usual to the own hushband to say tapai, just we say timi. How do you approch you parents? My boyfriend say tapai to his parents. Omg thats so unfamiliar for me. Looks like German language is easire compare to Nepali language.